Nowadays, every manufactured item that we choose has chemicals. But, when it comes to skin care and baby care, I read the ingredients multiple times before I choose a product. Since Baby wipes are very useful for babies for everyday use, it is very important for them to be chemical free. 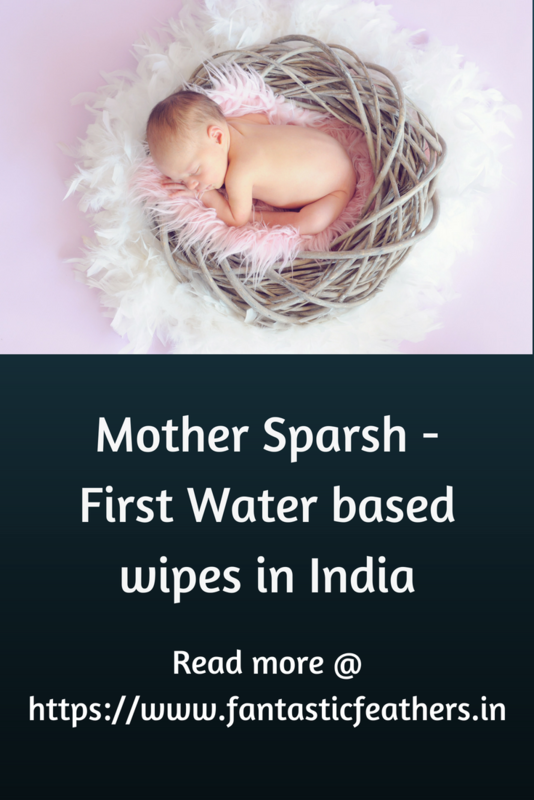 Found out about 'Mother Sparsh' Baby wipes recently from a friend and I am glad to share more details about these baby wipes which bring the goodness of water and plants for the delicate baby skin. I used baby wipes a lot when my son was in the infant stage. Since the baby's skin is delicate, I preferred baby wipes to soap water. I observed that many wipes available in the market were not biodegradable, not fragrance-free and a few are not gentle to the skin. I was looking for a clinically proven water wipes such as Mother Sparsh which are Paraben and alcohol-free. I was not aware of Mother Sparsh brand at that time. Since my son is grown up now, I use baby wipes only during travel to clean the mess after he eats food and keeping him clean during long drives. How Mother Sparsh Baby wipes are different from other wipes? Different health organizations like NICE, UK, and others clearly advocate that cleaning with water is much safer as it avoids allergies and irritation to the skin. Which means, Mother Sparsh baby water wipes are made with 100% viscose super soft fabric which is gentle on the environment as they are Biodegradable. Just, think about every wipe that we throw away after use. These constitute 7.6 billion pounds of garbage every year. To put it in another way, the wet wipes are the third largest consumer item in landfills and represent 30% of non-biodegradable waste. The wipes are made with extremely smooth fabric which breathable and highly absorbent, unlike Polyester which tends to irritate the baby skin. Cleaning with Mother Sparsh baby wipes are as good as soft cotton and pure water. These wipes are available at all major retailers like Amazon, first cry , paytm etc., and they are one of the best seller products at Amazon. So, with all these benefits, it is definitely worth a try if you haven't used water wipes yet for your baby. Mother Sparsh is as good as cotton and water. Water and nature represent the purest form of care. If you don't want to rub plastic on baby's skin, consider these nature-friendly wet wipes which are made of plant fabric. Watch this video to know more about Mother Sparsh water wipes which are hypoallergenic and pH balanced. Mother Sparsh has initiated its journey around 1 and half years back with a clear motive to launch baby products that are gentle and maintain baby skin health. With this thought, we came with India’s first water-based wipes i.e. Mother Sparsh 98% water wipes. PS: This is a sponsored post but all opinions are mine.